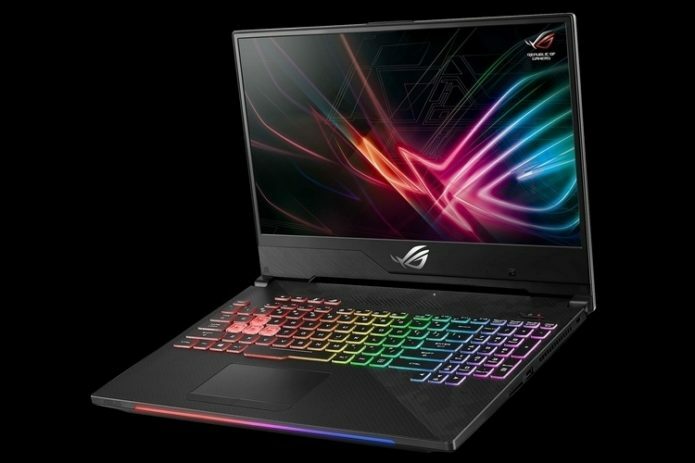 Announced back in June during COMPUTEX, the ROG Strix Scar II is the newest model in the company’s FPS-centric gaming notebook lineup. While already has quite a large swath of gaming notebooks already in their inventory, the Scar II is aimed squarely at gamers who want the best FPS experience possible in a moderately-priced gaming machine. It’s the same logic behind the Hero II, which is aimed at delivering the best experience for online play. The Scar II doesn’t bring a whole lot of improvements over the earlier model, offering small iterative jumps instead of large technological leaps. People who already own the previous model shouldn’t upgrade to this, though gamers in the market for a new, solid gaming notebook for first person shooters should be taking a close look at it. The ROG Strix GL504 Scar II is a gaming notebook made for gamers who enjoy FPS games. While there’s a ton of similarly-equipped notebooks from ASUS’ own stable, the Scar II tries to combine a slew of FPS-centric features into gaming notebook that slots between hard-hitting, big and chunky machines and the thin-and-light gaming notebooks like the Zephyrus. Honestly, we’ve never been a fan of gaming aesthetic of RGB lights stuffed everywhere, and the Scar II is no exception. While we like the obviously Zepherus-inspired lid and the light up ROG logo on it, the RGB light bar at the front was just too much for our taste. The chassis has a nice faux carbon fiber texture on it though it’s ruined by that subtle camouflage pattern near the edge. The notebook is rather thick and bulky but not as much as other gaming notebooks with roughly the same specs, which is a nice plus especially if you plan to haul it everywhere and you have the failing back of a middle-aged man. You do get a plethora of ports, which include three high-speed USB ports (two on the left, one on the right side of the chassis), a USB Type-C port, full sized HDMI port, mini DisplayPort, an Ethernet port, 3.5mm jack and an SD card reader. It’s probably the best part of the notebook. Unlike most gaming notebooks nowadays, the Scar II has a big 15.6-inch, full HD screen with very small bezels. It’s not as thin as the one on say, Dell’s XPS 13 but it’s still quite small and is 2.3mm thinner than on the previous generation. The display doesn’t come with technology like NVIDIA’s G-Sync or AMD’s FreeSync, but it does sport a 144Hz refresh rate, higher than other gaming notebooks. It has a 3ms response time – quite fast for an IPS panel. As for actual display quality, the screen is bright, vivid and totally usable under sunlight. The display has an anti-glare coating so you can still see it even when the sun is out, though we wonder why you’d want to game in the outdoors anyway. The Scar II comes packed with either an Intel Core i7-8750H or a Core i5-8300H, with GPU options ranging from an NVIDIA GTX 1060 or 1070. Take note that the GPUs used on the Scar II aren’t the limited MaxQ ones – these are the same chips that reside in desktop cards. Other specs include RAM up the wazoo (up to 32GB of 2666MHz SDRAM) and a mix of 5400RPM/7200RPM 1TB HDDs and M.2 NVMe PCIe (128GB/256GB/512GB) SSDs. Our review unit came with the Core i7 CPU, NVIDIA GTX 1060, 32GB of RAM and 256GB of SSD paired with a 1TB HDD. With the hardware, the Scar II was able to handle the three games we benchmarked with it well. Middle Earth: Shadow of War, For Honor and Far Cry 5 posted FPS near or around 60 FPS at ultra and high settings without too many problems. We did notice that we needed to turn up the fans on the notebook to its overdrive setting to avoid thermal throttling. How’s the rest of the notebook? We absolutely loved the keyboard on the Scar II, despite our complaints about its gamer-chic design. The WSAD keys are highlighted white, which is understandable considering it’s supposed to be a gaming machine aimed at FPS players. The keyboard is backlit, powered by ASUS’ Aura Sync technology though you can’t change the color of individual keys, just preset “zones” that include the light bar at the front and the ROG logo on the lid. The individual keys feels amazing to the touch, which is important for a gaming machine that’s aimed at FPS players. Key travel is great and actuation is smooth. We usually hate typing long reviews on notebooks but that’s not really an issue with the Scar II. The trackpad is good as well, easy to use and is comfortably placed. It serves its purpose when you’re out and about, but it’s no substitute for a gaming mouse. The sound from the side-firing speakers is pretty great, and you can crank up the volume without experiencing loss of clarity. There’s oomph behind the bass as well – perfect if you’re home alone and don’t want to hook up a pair of headphones or speakers to the notebook when you game. The fans are quiet and only spin up to noticeable levels when you start playing games. By that time fan noise gets drowned out by the speakers anyway, so it’s not a big issue. Dismal. It’s not really surprising, given that gaming machines aren’t exactly made for longevity but even with all the settings cranked down (screen brightness, power saving mode, etc.) the Scar II only barely managed to stay on for almost four hours. You’ll be constantly hunting for an outlet if you decide to make the Scar II your main productivity machine. ASUS’ ROG Strix Scar II has become the weapon of choice for us for the three weeks we’ve had it, and suffice to say we’re pretty impressed. The excellent screen with skinny bezels, the solid hardware, top-notch sound and fantastic keyboard make it a great choice for people looking for a powerful notebook to game on. Sure, the Php 129,995/$2,448 price tag is a little steep, but if you’re already spending a princely sum on a gaming notebook, why not get one of the best options out there?